One-click file hosting, or some people call them cyberlocker websites, are websites like RapidShare, Netload, RyuShare or File Paradox etc, that allow anyone to upload and download files for free. These online services have been very popular over the years and it’s even resulted in a few big sites like Megaupload and FileSonic being shutdown by the authorities. It doesn’t take very long for a few new ones to resurface on the Internet as it’s a very lucrative business. Many people use them because these one-click file hosting sites are able to host really huge files ranging from a few hundred megabytes for free users, to several gigabytes for paid premium users. Moreover, they are easier to download using only a web browser, unlike through BitTorrent that usually requires client software and optimal configuration. Unless you’re a paid premium user or have a multi-host download account, there are some annoyances when downloading files from the one-click file hosting sites as a free user. The download speeds are slower, no resume support, no simultaneous parallel downloading, download delays, restricted features and advertisements with fake download buttons. If you’re a heavy downloader and cannot afford a premium/multi-host downloader account, here are 8 free download managers that supports automated downloading multiple parts from one-click file hosting sites. 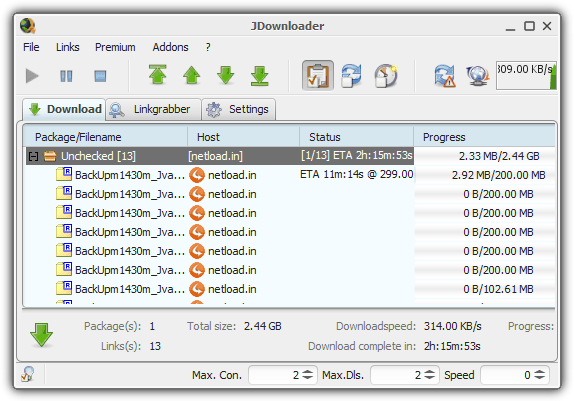 JDownloader is the most impressive java-based download manager to automate downloading from one click file hosting cyberlocker sites as a free or premium user. Unlike other alternatives, JDownloader recognizes nearly every file hosting website and they have their own custom made decrypter modules to decode encrypted links and get the real download URL. JDownloader is supported by 74 developers and 15 reporters with an active community board that made it all possible for them to provide an update about every 2 weeks to fix any broken or add new unsupported hosts. In comparison of features, JDownloader also wins hands down. It is able to bypass certain weak CAPTCHA codes, auto reconnect to get a new IP address for downloading the next part rather than waiting, support both free and premium download methods, automatically extract a package including using a password list when downloading is complete, check links validity, multi-host download accounts, clipboard monitoring, and add-ons such as anti standby, hjsplit, shutdown, remote control, scheduler, web interface etc. As powerful as JDownloader is, it is well known to use up quite a lot of memory up to 150MB in our test. The initial installation can take a while to complete whether you use the web or offline installer because the web needs to download all the files while the offline version needs to be updated. You would probably get the best downloading experience with Mipony if for some reason JDownloader doesn’t work for you. Mipony is a download manager that supports downloading from direct URL, one-click file hosts with free/premium accounts, and even a multi-host downloader account such as Real Debrid, All Debrid, Zevera, LinkSnappy and MultiDown. The list of supported hosts is quite extensive reaching nearly 200. Mipony has every feature to assist in automating downloading such as clipboard capture, link detection of recognized hosts (no decryption), plugin support for third party automated solving CAPTCHA service, automated RAR extract using a list of passwords, join split files, scheduler, remote control via web interface or an android app. It also uses the free and open source tesseract OCR engine to provide limited auto CAPTCHA solving. As you may have noticed, Mipony doesn’t support reconnection to refresh your IP address and also lack of a simple option to automatically shut down the computer when download completes. The CryptLoad developers used to be very active in creating one of the best one-click file host download managers including defeating tough CAPTCHA systems, but unfortunately the progress of the major updates seem to have stalled. The current version of CryptLoad is 1.1.8 is the same since 2009 and a few plugin updates are still being pushed out every 1-3 months. You can still find a few dead hosts such as FileSonic, Megaupload and Oron listed in Settings > Plugins > Hoster. CryptLoad is a free and portable download manager that runs on .NET Framework 2.0 with built in CAPTCHA recognition (currently only work on 6 hosts) and support for FineReader (a shareware OCR) or AutoImager. CryptLoad focuses more on reconnect feature with 3 methods (modem, router, external file) to reset your connection for a new IP address and the rest of the features are quite basic. Load! is free and has been around since 2007. It actually has a lot of potential because every necessary and useful feature can be found on the program. Clipboard monitoring, container support, auto extraction with password list, action after all downloads are completed, proxy, reconnect, anti-captcha, and even a unique macro recorder to automatically playback recorded user actions based on the events in the program. CandiSoft Load! uses its own OCR-module called Catcher! which is based JAntiCaptcha from JDownloader to automatically solve CAPTCHA. It claims to only support netload.in, megaupload.com and share-online.biz but it doesn’t recognize the 4 digits when we tested it on netload. Most people would recommend FreeRapid Downloader as a JDownloader alternative because it runs on Java and supports more than 500 hosts. FreeRapid has lesser memory usage and that correlates with the listed features. It does not have a reconnect feature but it’s focus is on using a proxy list to download as a free user without delay. Standard features such as auto shutdown, simple CAPTCHA recognition using GOCR, clipboard monitoring, containers support and automatic updates are built into the program. 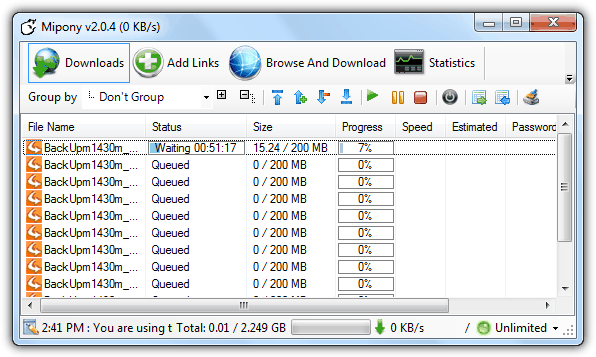 FreeRapid Downloader currently lacks a feature to automatically extract the compressed files when finished downloading. 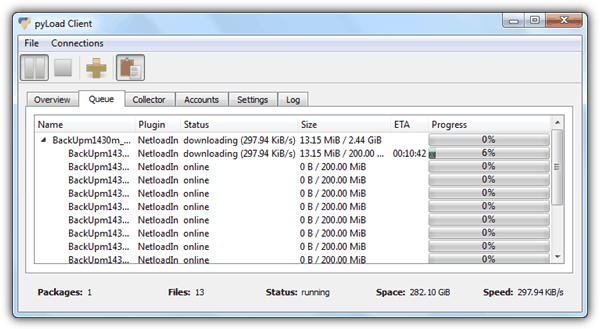 ochDownloader is a simple, free and portable download manager that is able to pick up direct download HTTP links and slightly more than 10 one-click file hosts. 3 addons are built-in to the program to monitor the clipboard, renew IP and auto extraction from a list of passwords. Do take note that ochDownloader can only download as a free user and does not support premium accounts. ochDownloader is the new kid on the block that still needs a lot of work to fix the bugs that we discovered nearly instantly when we start using it. We weren’t able to download a package of multi-part files with 200MB each hosted in Netload but weirdly it worked when we tried to download a small 300KB file on the same host. Not only that, ochDownloader also fails to recognize the time to wait before downloading the next file. It will continue retrying until it reaches the maximum limit set in preferences. pyLoad is an interesting download manager that is completely written in the python programming language and unbelievably it’s packed with features to work on one-click-hoster, containers, video sites and the normal direct HTTP or FTP links. pyLoad supports clipboard monitoring, free and premium accounts including multi-hosts downloader, web interface, reconnect, captcha recognition through third party service or the tesseract engine, IRC/XMPP interface and archive extract. You will need to go through the initial setup before using. When the setup is complete, pyLoadCore will automatically run an update to download the latest files and plugins. Once you see that that the core program reports that there is no plugin updates available and pyLoad is up and running, you can now run pyLoadGui.exe for the GUI or login using your web browser to your local address http://127.0.0.1:8000/. Everything on the pyLoad client is pretty self explanatory except there is one annoyance where you’ll find some options in the Accounts tab and the Plugins tab in Settings not sorted alphabetically. This problem doesn’t exist in the pyLoad Webinterface. With the Dapster add-on, Download Accelerator Plus is able to automatically download files from one-click file hosting sites by adding the links to the program. 33 hosts are supported by the Dapster add-on but a few invalid ones such as Oron, Megaupload, FileSonic, Wupload, Zshare are still included in the list. Download Accelerator Plus does not come with any ability to auto recognize the CAPTCHA for free users and will prompt a dialog box for the user to manually enter the code. Important Note: A lot of effort and dedication needs to be put in to these applications because any changes both big and small made on the file host will probably break the downloading functionality. Fortunately all of the download managers mentioned above comes with an auto update feature to make sure that you get the latest version. We’ve also tested Tucan Manager, Universal Share Downloader and MDownloader but they no longer work because they are no longer being maintained. Actually Mipony does include an “option to automatically shut down the computer when download completes.” Even in the embedded picture the black power bottom is clearly visible. Great tip for free users mate, even though free users can take advantage of Rapidshare generators and RapidLeechers. thank you very much raymond. Awesome, will give this a try. Rapidshare can be so annoying when waiting.